November 10, 2013, 3:08 PM · Lamarcus Adna Thompson was born in Jersey, Ohio on March 8th, 1848. The man who would later be known as the "father of gravity" started life first as a carpenter, then a successful businessman. By the age of 35 he had made a fortune after founding a company that manufactured women's stockings. The hosiery business took a toll on Thompson's health, and so he left the business. After a trip out west, he found himself in New York in the early 1880's. It is said that L.A. Thompson was inspired by a trip to the hills in eastern Pennsylvania, where a railroad line running through Carbon County had been converted from a coal transport into a tourist attraction. The Mauch Chunk Switch Back Railway was an 18 mile, mostly downhill course that featured a 2300 ft long, 665 ft high drop at the end. The railway was a rousing success with tourists, who came by the thousands to ride every year. Thompson's idea was to capture the essence of Mauch Chunk in a smaller package. And so it was that the first authentic American roller coaster was built. Borrowing from previous unfinished designs and applying his own ideas, Thompson obtained patent no. 310,966 for his "Switchback Railway." 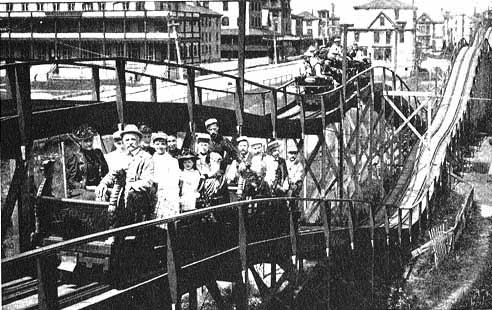 The ride opened at Coney Island in 1884 and was an immediate success. Charging 5 cents a ride, Thompson was clearing $600 a day in profits almost immediately. The ride was very modest by today's standards, standing just 50 feet tall, 600 feet long, and about 10 mph, but it was also something that had never been seen before. Riders boarded bench-like trains and coasted to the bottom on mild, undulating hills, and then repeated the journey in the opposite direction. Before the 1884 season even ended at Coney Island, Thompson already had competition. Rival builders capitalized on his success with designs of their own, each a little bigger and faster than the last. In just a few months, two more coaster builders appeared at Coney with a new creation, followed by several more in coming years. 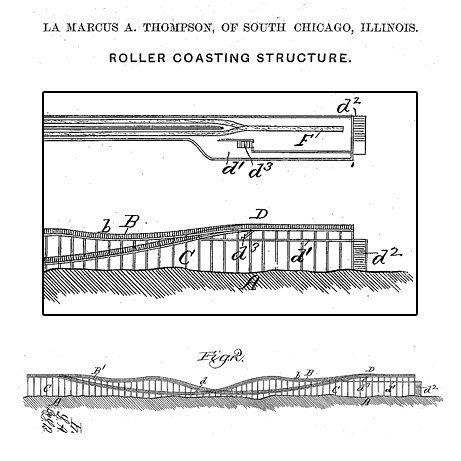 Thompson spent the next three years improving his design, obtaining another 30 patents and building the coaster in cities across the country. In just four years, he had built 50 of them. While his competitors were focused primarily on making their rides higher, faster, and steeper, Thompson began to experiment with visuals…first with tunnels and lights, and then with scenery to create a new type of ride. 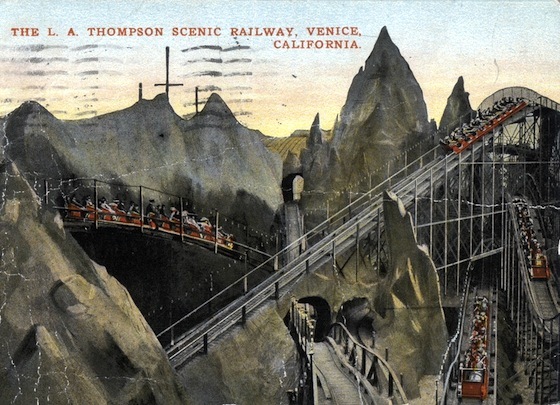 The LA Thompson Scenic Railway combined elements of his earlier creations with visuals. The first one opened in 1888 with great success, leading him to form his own company, opened for the express purpose of building Scenic Railways around the world. Each version of his Scenic Railway was more elaborate than the previous version, containing more and more visuals. The most notable was the installation in Venice, California. Opened in 1910, the track ran among artificial hills lights, and replicas of temples, foreshadowing attractions that would be built by Disney decades later. Thompson the man was himself a visionary. Similar to many of his contemporaries and those who followed, he thought many of the leisure pastimes of his day to be unsavory. The saloon and the brothel were popular attractions of the day, and the cities were crowded and dirty. He envisioned the amusement park and the rides as a more wholesome alternative form of entertainment and a place to escape. 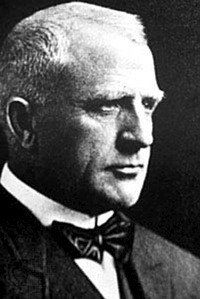 L.A. Thompson passed away in 1919. One of his designs lives on in Melbourne's Luna Park in Australia, although much of the scenery has long since been removed. While not actually credited for being the inventor of the roller coaster, Thompson was the one who introduced it to the masses, entertaining people and inspiring others to build their own, creating a ride that would one day become the king of the midway and pioneering the art of the themed ride. November 10, 2013 at 3:55 PM · Great article as always, Derek. I love things about the history of theme/amusement parks- it tells us how we got to where we are today. I also know that when I see your name on the byline I know it will be a quality article. Thank you, Derek, for educating us about the amusement park industry one article at a time! November 11, 2013 at 10:15 AM · "2300 ft long, 665 ft high drop at the end." Hard to visualize, considering Kingda Ka is 456 feet high. Or am I missing something or reading it wrong? November 11, 2013 at 1:04 PM · "2300 ft long, 665 ft high drop at the end.". That's a misleading statement. To begin it didn't have a drop based on today's definition of what a roller coaster drop is, so it's a not a good term to use to describe it. More accurately the track had a long, straight descent down Mount Pisgah with a total elevation change of 664-feet from the top to the bottom. However, to put it in better perspective it took the cars 30 minutes to descend the 664 vertical feet (a rate of 22.1 feet per minute) and with the steam powered engine it took 50 minutes to ascend the same section. Today, kiddie coasters are more exciting! Originally, it took 4 hours to ascend with mules pulling the cars uphill. I can't find any sources that support the 2,300-foot long length for that particular section with that vertical drop, but it may be correct. In reality there was nothing thrilling by today's standards and it certainly wouldn't look as impressive as some of the rides today like Kingda Ka. November 11, 2013 at 3:10 PM · Wow, awesomely interesting. It makes me feel a little guilty though, particularly when I consider myself a theme park aficionado. I live in Melbourne and I've never been to Luna Park (the only amusement park in our city). I went to Disneyland when I was 5, and since then have turned my nose up at Luna Park which is simply a small amusement park, very old school in its design with no real modern attractions. Knowing the history of it now a bit better, and that our Scenic Railway is the oldest continuously running roller coaster in the world, I realise what a treasure we have and will have to take steps to rectify my non-attendance. I will also need to make sure that my own children do not make my mistake. Thanks for writing this, it has opened up my eyes. November 11, 2013 at 6:10 PM · Eric, the Mauch Chunk was a little more than that. There were a few incarnations of the railway. The early/mid 1800s version wasn't nearly as long, was still hauling coal, and was shorter and mule driven. The 18 mile long gravity driven, finished product was finished afterward, and by 1874 was exclusively a tourist attraction, which is what LA Thompson would have probably seen. It was quite faster than before, and many accounts refer to the ride as "harrowing". Call the drop a descent if you like. It's not meant to be a competition against modern day coasters. Thanks for the kind words everyone. It's great to move forward into new things, but equally great to appreciate the old ones. There's a lot of beauty in the old things. November 12, 2013 at 10:16 AM · James, you're spot on with the Spencer tracy comment. It truly is a mad, mad. mad, mad world of coasters and amusement/theme parks. November 13, 2013 at 4:01 PM · If people described it as "harrowing" it was simply because there wasn't anything like it at the time. Today, an observation tower at a theme park is more thrilling. I just think it's important to use the correct terms, so people clearly understand what you're describing.